What is Revofil Aquashine BTX? 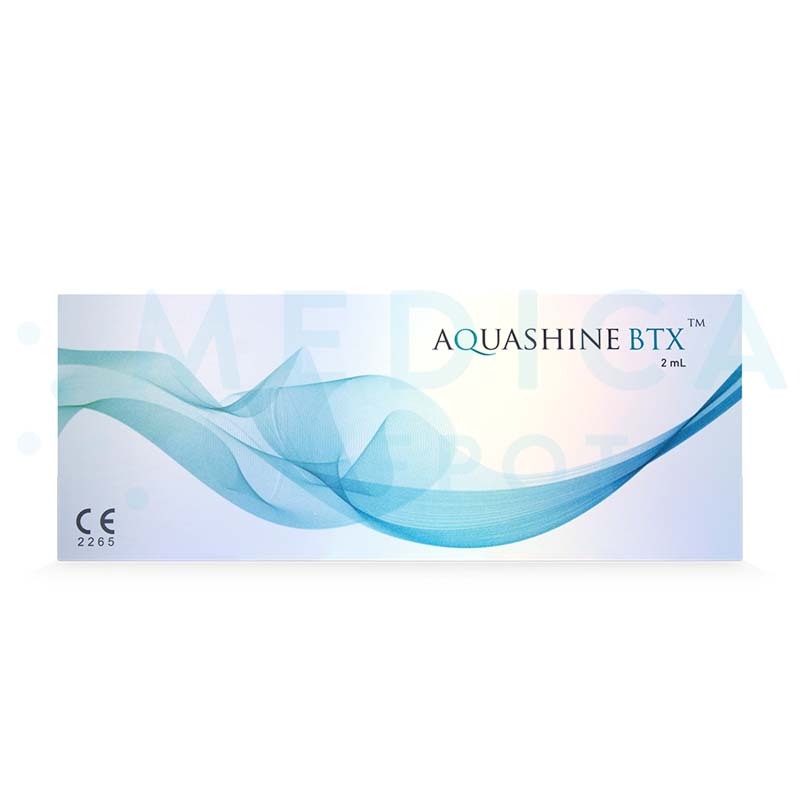 Aquashine BTX is a revitalizing dermal filler made with sodium hyaluronate and a biomimetic peptide complex. Doctors may inject this soft filler to correct facial wrinkles while revitalizing aging skin. Most dermal fillers contain only hyaluronic acid, but the addition of peptides to this filler increases its elasticity and stability, helping it last longer with more flexible and natural-looking results. Where can I buy this dermal filler? 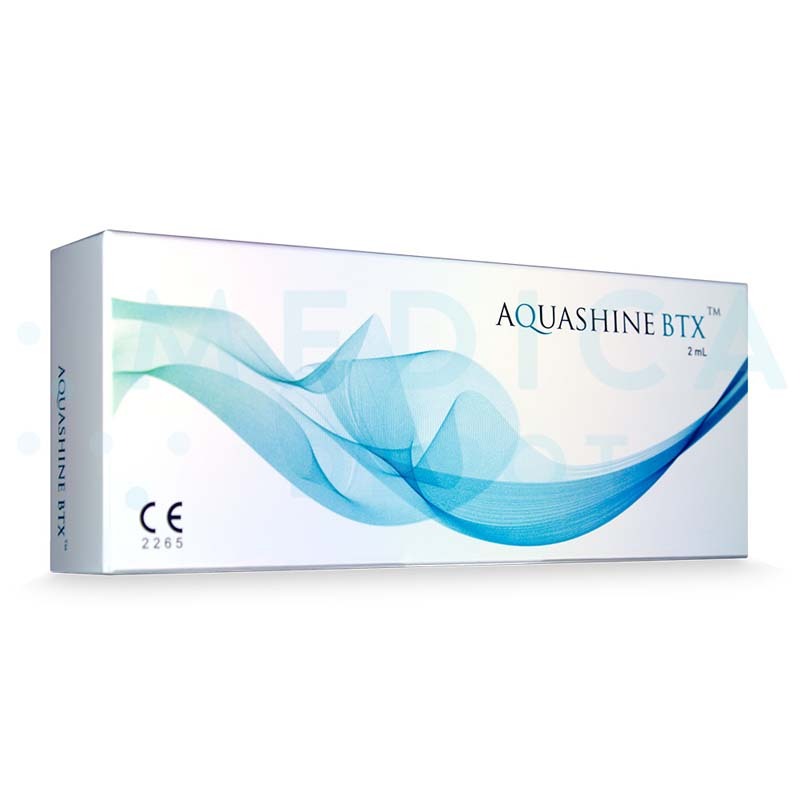 Buy Aquashine BTX online from Medica Depot. Enjoy the convenience of purchasing this and other aesthetic products online while benefitting from our low wholesale prices. Medical professionals may purchase this and other genuine brand-name dermal fillers online, by phone, or by fax. What are the benefits of this cosmetic injectable? And its enduring effects last for 10–12 months. How does Aquashine BTX work? 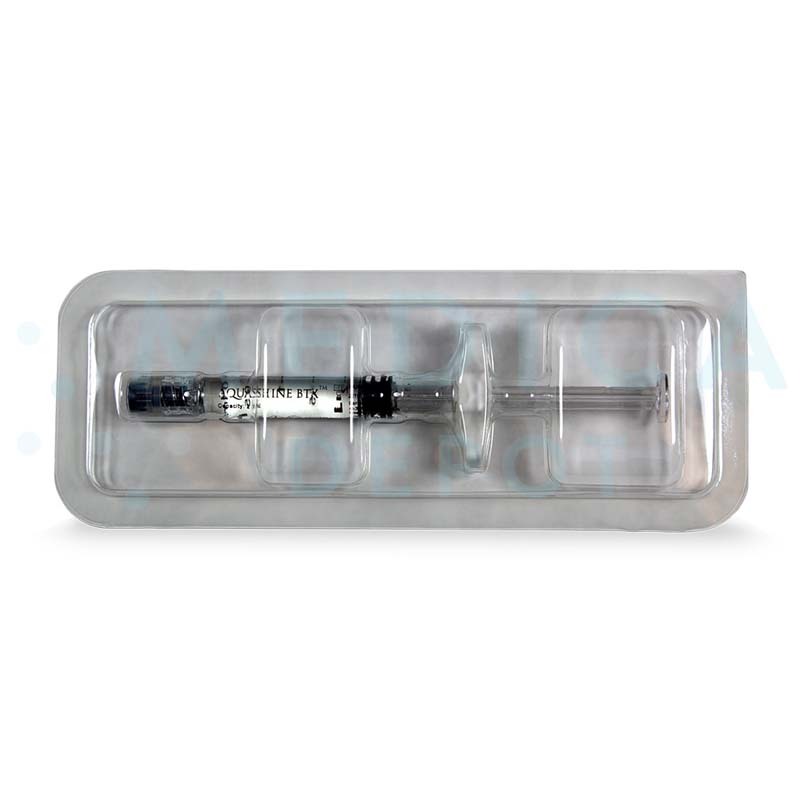 This injectable gel is made of sodium hyaluronate, which is also known as hyaluronic acid. This substance has an innate ability to bind to water molecules in the skin, adding hydration and cushion to the dermis. With this, it restores volume to the face, supporting the skin and smoothing the look of wrinkles at the surface. Moreover, this filler’s biomimetic peptide complex strengthens the cross-linking of the hyaluronic acid bonds, which helps this filler to resist breakdown, remain elastic, and provide more natural-looking results. These peptides also stimulate collagen synthesis, which strengthens and firms the skin. What are the ingredients in Aquashine BTX? This dermal filler contains sodium hyaluronate and a mix of biomimetic peptides. What is the difference between Aquashine BTX and other cosmetic fillers? Most cosmetic fillers contain hyaluronic acid, but this filler contains an extra set of ingredients: peptides. These peptides work to improve the gel’s elasticity and durability, giving more natural and longer-lasting results than its competitors. Inject this dermal filler in the mid to deep dermis. Avoid injecting too superficially and avoid overcorrecting, as this will provide unwanted results. Additionally, please follow proper aseptic techniques during the injection process. 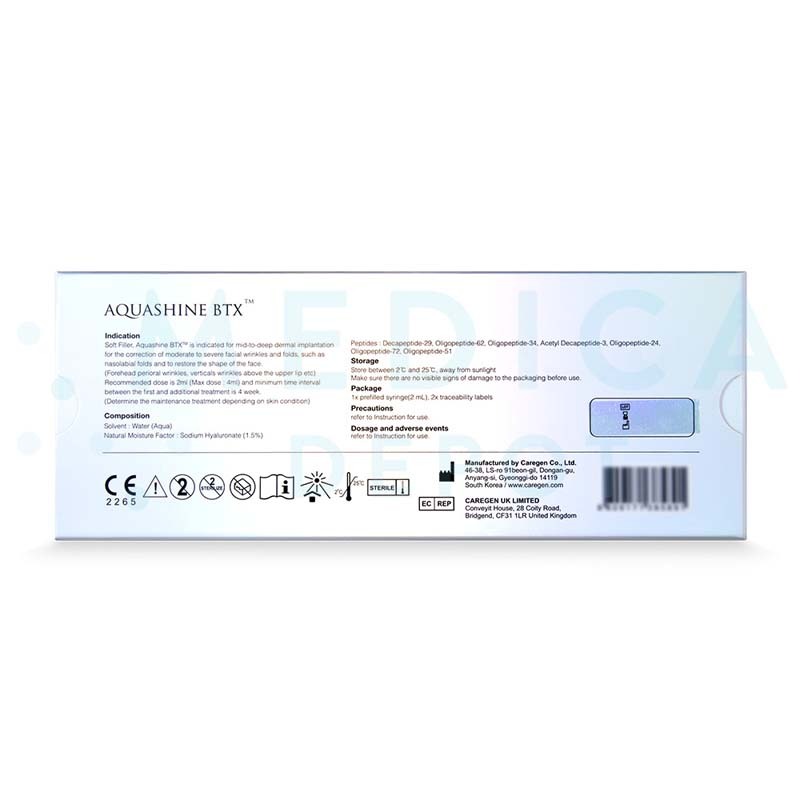 For more information on how to inject Aquashine BTX, please consult the included product leaflet. When should I use this sodium hyaluronate filler? This product is indicated for use on patients with facial wrinkles and other visible signs of aging. The results of 1 treatment should last at least 10 to 12 months. However, the duration of this product may vary from patient to patient. Repeat this treatment no more often than 4 weeks after the first treatment. What areas of the body can I treat with this aesthetic product? You can use this dermal filler to correct moderate to deep facial wrinkles. Who is an ideal candidate for Aquashine BTX treatments? The ideal candidate for these treatments is one who is experiencing moderate signs of aging. These injections can help improve skin quality for smoother, more elastic skin. Why should I purchase Aquashine BTX? Purchase this cosmetic filler to help your patients reduce the look of wrinkles with long-lasting results. Aquashine BTX is made by Caregen, an innovative, trusted name in aesthetics, so you and your patients can count on this injectable filler to provide quality results. The inclusion of peptides in this filler not only improves the product’s durability, but also stimulates collagen growth for rejuvenated skin quality. 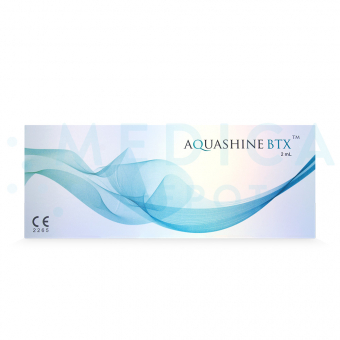 Most of all, by purchasing Aquashine BTX from Medica Depot, you save money with low wholesale prices. What are Aquashine BTX’s side effects? While Aquashine BTX is generally well tolerated by patients, some common side effects may occur. These include redness, swelling, and pain around the injection site. For more information on the side effects of this dermal filler, please consult the included product pamphlet.